You know, a great big fat person once stood on this stage and told a group of a dozen or so nerds in hideous disco outfits that glee, by its very definition, is about opening yourself up to joy. Now it's no secret that for a long time I thought that was a load of hooey. As far as I could see the glee club was nothing but a place where a bunch of cowardly losers go to sing their troubles away and delude themselves into thinking that they live in a world that cares one iota about their hopes and dreams, totally divorced from the harsh reality that in the real world there's not much more to hope for than disappointment, heartbreak, and failure. And you know what. I was exactly right. Thats exactly what glee club is. But I was wrong about the cowardly part. What I finally realized, now that I'm well into my late thirties, it takes a lot of bravery to look around you and see the world not as it is but as it should be. A world where the quarterback becomes best friends with the gay kid, and the girl with the big nose ends up on Broadway. Finding the courage to open up your heart and sing about it. That's what glee club is. And for the longest time I thought that was silly, and now I think it's just about the bravest thing that anyone could do. Thank you. Oh, my gosh, I want to thank my amazing husband and director, Jesse, and my two dads for all of the singing and dancing lessons. I want to thank Carmen Tibideaux at NYADA for giving me a second chance at my degree and all my friends at McKinley High. But, um, I want to dedicate this award to the person who is responsible for getting me on this stage tonight and that person is Mr. Will Schuester. Mr. Shue always taught to my strengths and not my weaknesses and he cheered the loudest when I soared and he picked me up when I was in a million pieces. He taught me the one great thing that all great teachers do, and there are so many of them out there, and that is being part of something special does not make you special. Something is special because you are a part of it. Mr. Shue I love you so much. And to all the boys and girls out there, I just want to say quickly before I walk off, that dreams really do come true. Porcelain, the first moment I laid eyes on you, I truly didn't understand what I was looking at. With your hippo broaches and your knee length sweaters, standing there all sassy with your arms crossed and your hips cocked out and your eyes rolled back as if to say 'oh, how droll...' But then I got to know you and even though you still constantly annoyed me I got to watch you go through what you went through. The whole coming out thing with your dad, the death threats from the bully whom Blaine later dated. I never knew I had thoughts and feelings about those things until I watched you go through them. You expanded my mind. You taught me things about myself that I would have never discovered on my own. And for that I thank you. Mercedes Jones has left the building. Permalink: Mercedes Jones has left the building. 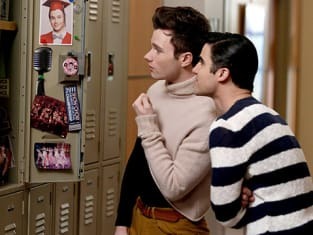 Blaine: Well, looks like we're all right where we belong. Will: I wouldn't have it any other way. Permalink: I wouldn't have it any other way. Sam: New York's not my speed. It's too fast, it's too loud, there's too many sports teams so I get confused on who I'm supposed to root for. Blaine: We just root for whoever's winning. Permalink: We just root for whoever's winning. I'm so proud of you, Will. It has been quite a journey to get to this place and you've made it the whole way without losing your integrity. Except for those days when you were rapping. Glee Series Finale Photos: Don't Stop Believing!